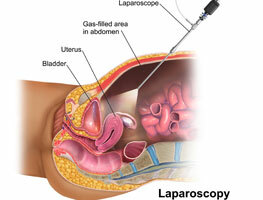 Laparoscopy is a type of surgery. As a diagnostic procedure, it is used to examine the organs inside your abdomen. This is also referred to as a diagnostic laparoscopy. Laparoscopy is a minimally invasive procedure. Only small incisions are made. Laparoscopy uses an instrument called a laparoscope. The laparoscope is a long, thin tube with a high-intensity light and a high-resolution camera at the front. Laparoscopy allows your physician to see inside your body in real time, without open surgery. Your physician also can obtain biopsy samples during this procedure. A laparoscopy often is used to identify and diagnose the source of abdominal or pelvic pain.